Needlepoint canvas is rough. Unless you protect the edges, your thread can get snagged on them. There are many ways to do these, but the most common is to use artist’s tape, AKA “that white tape” (read about it here). If you are taping just for yourself, you probably cut off a length of tape, place the canvas partway on it, and then fold over the remaining tape. After cutting off the excess at the ends, I use a bone folder to make the seal secure. But this method is too slow if you have lots of canvases to tape, or need to tape often, as shops and teachers do. They use a nifty machine called and edge binder. You can learn about it in a post by Debbie Rowley of Debbie’s Designs. 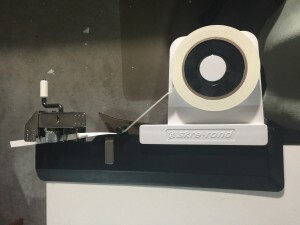 Where could I purchase branded tape for an edge binder machine? I believe a wholesale distributor, Fleur de Paris, sells this. Minimum quantities are a dozen. You might also try a Google search for custom printed artist’s tape to find other sources. Last I heard the machines for taping canvas were no longer made.